The Chicago Blackhawks reacquired defensemen, Johnny Oduya today from the Dallas Stars for forward Mark McNeill and a conditional 4th round pick. Oduya, a member of the 2013 & 2015 Stanley Cup championships will most likely be reunited with fellow Swede, Niklas Hjalmarsson. The addition of Oduya now gives the Blackhawks at minimum, five veteran defensemen that can play 20+ minutes and play solid defense. A huge factor during a long playoff run. The 4th round pick becomes a 3rd round pick if the Blackhawks win two rounds and Oduya plays in 50 percent or more of the games. Dallas will retain 50% of Oduya's salary. Stan Bowman works yet another trade deadline move to strengthen for another Cup run. Jonathan Toews and Patrick Kane, both had a goal and an assist, and Scott Darling had 30 saves, as the Chicago Blackhawks beat the St. Louis Blues, 4-2. The Toews line started hot again as Nick Schmaltz fed Toews with a pretty pass, and Toews beat Allen with his 16th of the year for an early lead. Toews then assisted on Kane's 24th of the year and a quick 2-0 Hawks lead. The Blues would tied it before the first period ended to cut the lead in half. Alex Pietrangelo would tie the game on the power play in the 2nd to knot the game at 2 going into the 3rd period. 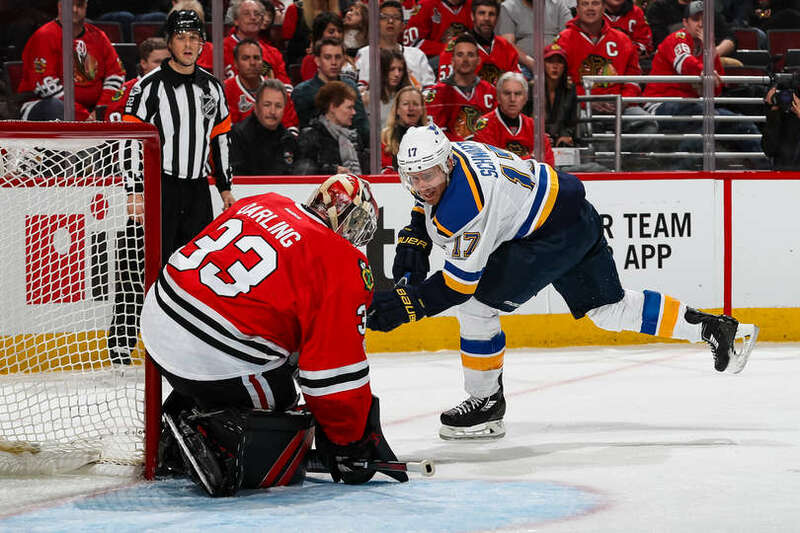 Scott Darling and Jake Allen made some huge saves to keep the game close. Both teams had great chances until Artem Anisimov scored (22nd) with less than six minutes left to give the Hawks a 3-2 lead. Tanner Kero would add an empty net goal to finish the scoring. Notable Mentions: Paul Stastny will have nightmares tonight as the three biggest saves that Darling made, were on him. Toews' goal ties him for 8th All-Time on the #Blackhawks goal list with Jeremy Roenick at 267. Duncan Keith's assist on Patrick Kane's goal was his 500th career NHL point. Toews now in his lat 14 games has 24 points (9G 15). 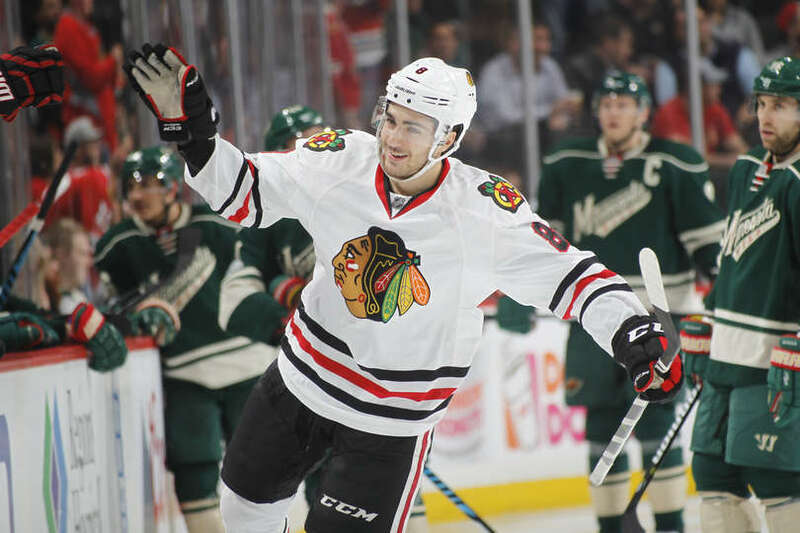 Blackhawks are now 1 points behind the Minnesota Wild in the Central Division. Minnesota still holds 3 games in hand on Chicago. 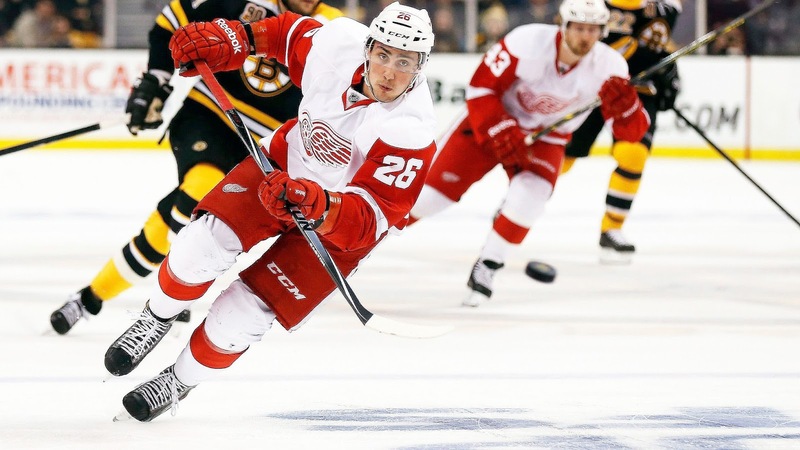 The Chicago Blackhawks made a depth move yesterday as they acquired left winger, Tomas Jurco from the Detroit Red Wings for a third round pick in the upcoming 2017 NHL Entry Draft. 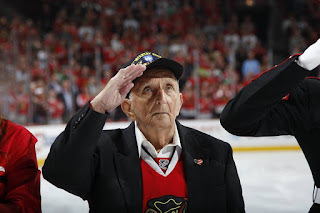 With the confidence of players like Nick Schmaltz and Ryan Hartman, Blackhawks General Manager, Stan Bowman claimed he was not in need of a Top 6 forward. Jurco, 24, has spent 4 years with the Red Wings tallying 39 points (15G 24A) in 159 career games. This year had not been going well for Jurco in Detroit, where in 16 games, he had not registered a single point. A move was needed. Jurco is in the last year of a contract, but will be a restricted free agent at the end of the year. Bowman has had his eye on Jurco for a number of years and liked his play. He is not expecting him to carry the team in any way, but he sees the potential in him to where he can be a contributor in another run at Lord Stanley's Cup. 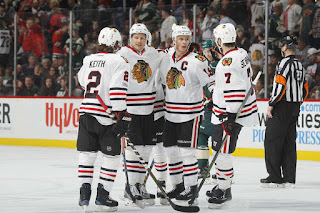 The Blackhawks sit 3 points behind the Minnesota Wild, who are in the their bye right now. There had been no update on Niklas Hjalmarsson who had left Thursday night's game against the Arizona Coyotes early and did not return. The Blackhawks currently have two games remaining in a cushioned time where they will play just eight games in twenty-four days. In that time, the Hawks have taken advantage by winning five of the first six games so far. They take on the St. Louis Blues Sunday at the United Center. Bowman is hoping that Jurco will be able to join his new team for practice on Saturday. In order to make a roster spot for Jurco, the Hawks re-assigned Vinnie Hinostroza to their AHL affiliate, Rockford Icehogs. 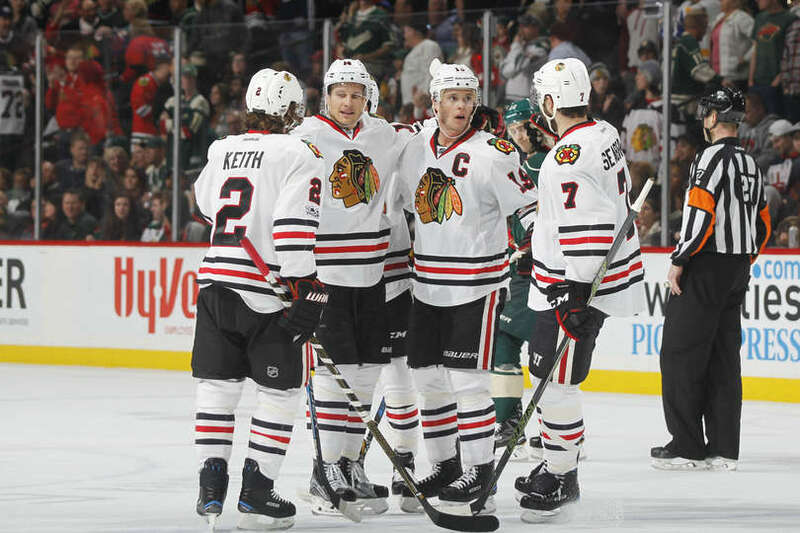 The Chicago Blackhawks have found themselves winners of 7 of their last 8 games after defeating the Conference leading, Minnesota Wild in their own building for the 2nd time in two weeks, with a 5-3 victory, leaving them 5 points behind the Wild. Coming off of the bye week, the Blackhawks lost a home contest to the Edmonton Oilers, 2-1, in which they could have easily had a different outcome, out shooting the Oilers, 39-22. But this has been their only smudge over the last few weeks. What has been the difference over these last set of games? Captain, Jonathan Toews has taken over, with a vengeance. Ever since the departure of Brandon Saad two years ago, Toews has never quite had a winger to compliment him and Marian Hossa. Till now. And the two players would not be anyone that you would have expected; Richard Panik and Nick Schmaltz. The chemistry between them has been huge with quite the return over the last 6 games. So who are these two wingers? Panik, 26, was acquired January, 2016, thought to be a minor deal, with the Toronto Maple Leafs, for forward Jeremy Morin. Originally a second round pick in the 2009 NHL Entry Draft by the Tampa Bay Lightning, Panik spent two years there before he was put on waivers and picked up by the Maple Leafs. After being dealt to the Hawks, he spent 30 games with them tallying 8 points (6G 2A). This year he started on fire with 6 goals on his first 9 shots of the season. He's already broke career highs in almost offensive category. He currently has 31 points (16G 15A). He is in a contract year, so the Hawks will have yet more work to do to try and keep a blossoming star for the future. Schmaltz, 20, was the Blackhawks' first round pick, 20th overall, in the 2014 NHL Entry Draft. He started his rookie year with the big club for the first 28 games this season, where he registered just 4 points (1G 3A). After spending a month with their AHL affiliate, Rockford Icehogs, where in 12 games, he tallied 9 points (6G 3A), he was brought back up to the Hawks. Since then, the rookie has shined on the top line with Toews and Panik. And Toews? Well, Captain Clutch has come through huge in this stretch of games where they had not won in their previous 8 games against the WIld, or any of the 4 games they played against Winnipeg this year. They've won in Minnesota twice and in Winnipeg in the middle of their 6 game road trip in which they went 5-1 to start the month. 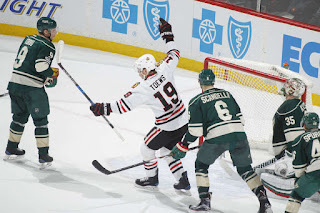 What is more impressive, is that Toews tallied both game-winning goals in Minnesota while tallying 8 points in the process (4G 4A) and was a +7. This against a team that is 21-8-1 at home and has a +60 goal differential. Over his last 12 games, he has 20 points (8G 12A). 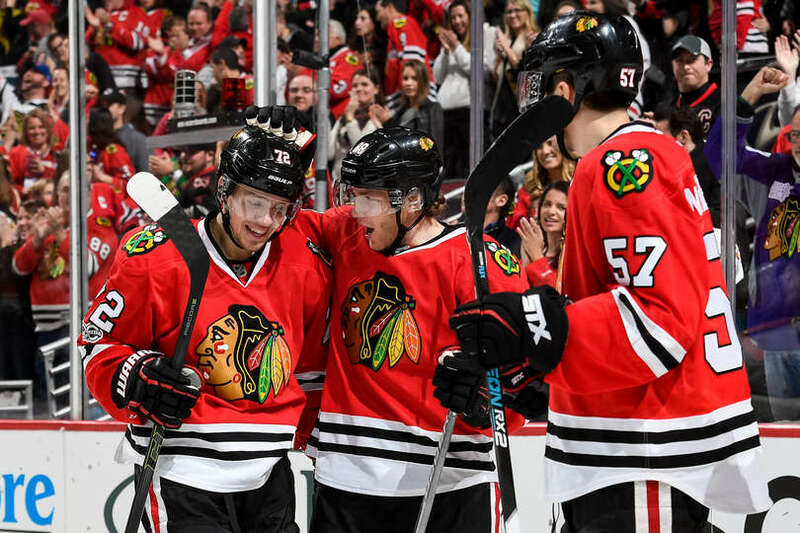 If General Manager, Stan Bowman, was worried to grab a quality forward at the trade deadline to pair up with Toews, he has since relaxed those thoughts. There are still 20 games remaining for the Hawks before the playoffs start, but for now, they are starting to play their best hockey. One thing is certain, any question of the Blackhawks being a playoff contender, has been answered. They sit just 5 points behind Minnesota for tops in the Conference. And with Toews and Kane, both heating up, that can only mean good things for Chicago and their fans. 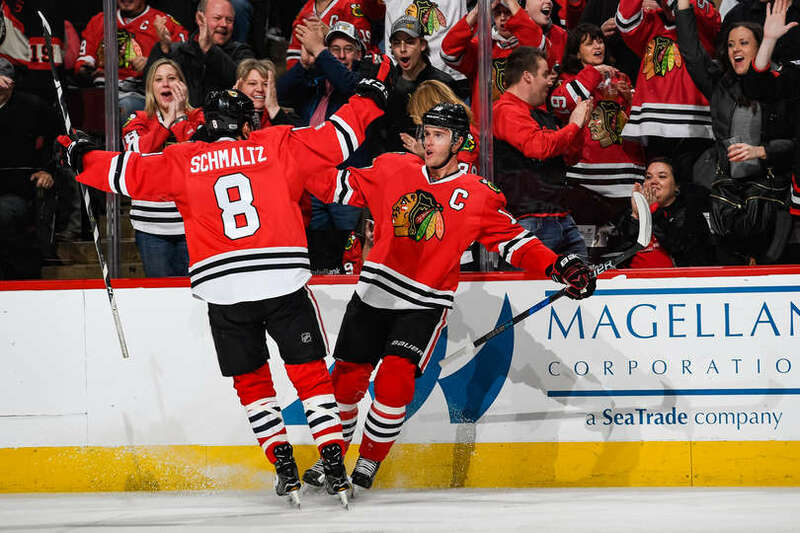 Will The Bye Week Actually Benefit The Blackhawks? The bye week was introduced this year to help alleviate a long 82-game season for teams. It was to give a minimum of five days off to rest and prepare for the rest of the grueling season and two months of post-season. Teams coming off of their break so far, are 3-12-4. 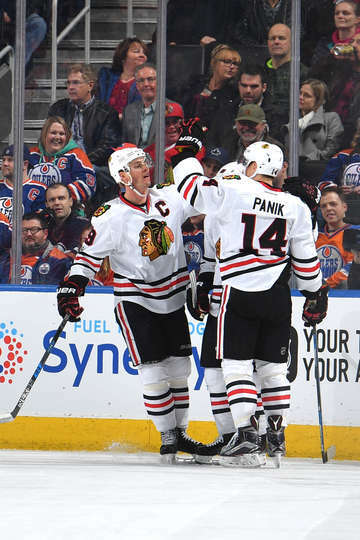 The Chicago Blackhawks lost to the Edmonton Oilers Saturday night at the United Center, 3-1. With that said, they did not play awful and they outshot Edmonton, 39-22. They just couldn't come up with the win. They bounced back Sunday as they handled the Buffalo Sabres, 5-1, in Buffalo. They play a huge game against the Minnesota Wild Tuesday night in Minnesota, who they trail by seven points in the Central Division. Including that game, they still only play 3 games in the next 8 nights. Including their bye week, they played just 8 games in 24 days. A game for every 3 days. So how does the rest of their schedule look then? Come March 1st, they begin a marathon to the end of the regular season. They play their remaining 20 games of the regular season in just 39 days. A game for every 1.95 days. Of those, 6 of their last 8 games are on the road. From October - January, they played 52 games in 112 days. A game for every 2.15 days. So based on that logic, why would the league make teams, in this case, the Blackhawks, play their most crucial, "must win" games, in the shortest amount of time leading up to the playoffs? How is this supposed to help them? When playoff time comes along, they will have to fight hard to rid a team early, (hard to do in this league) in order to catch any break. If the playoffs were to start today, the Blackhawks would be playing the St. Louis Blues. The Blues ousted them in the first round of the playoffs in a 7-game series last year. I understand what they are trying to do. And yes, the teams should get a break at some point. But considering they have had anywhere from 2-4 months off, between seasons, why wouldn't the league put the busier part of their schedule at the beginning of the season? Easier said than done, I know, but since this is an experiment, I think they need to tweak it a bit in order to make it more effective. Enter the new wild card next year in the expansion team, Las Vegas Golden Knights. This provides an odd number of teams in the league. Who knows what that will do to the schedule as well. Lets hope the league thinks this through a bit more and more importantly, keeps the safety and health of the players at the top of their priorities, instead of trying to find a way to generate more revenue. The Chicago Blackhawks over the last two seasons have traded their first round picks for a run at another Stanley Cup. In 2015, it paid off as their 1st round pick and defenseman, Klas Dahlbeck, were shipped to Arizona for forward, Antoine Vermette. Vermette was a key player in Chicago's third Stanley Cup in seven years. In 2016, that plan did not work out so well, as their first round pick, along with highly touted prospect, Marko Dano, were dealt to Winnipeg for rental, Andrew Ladd. 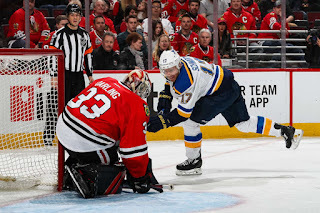 The Blackhawks were ousted in the first round against the St. Louis Blues. 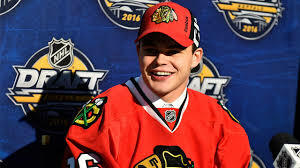 So, for their first pick in the 2016 NHL Entry Draft, which came in the second round, 39th overall, was forward Alex DeBrincat, from the Erie Otters. Some questioned the move because DeBrincat was a meager 5 ft. 7in. tall, and 165 lbs. There are those that questioned the drafting of Patrick Kane back in 2007 when he was measured at 5ft 10in. and 162 lbs. We've seen how that turned out. Is DeBrincat the next Kane? Probably not....but, let's take a look at how Alex has done in his career with the Otters. Okay, so, he's been doing pretty good. Pretty DAMN good. He's currently averaging 2.06 points per game this year. In 2014-15, he happened to play with an up-and-comer, named Connor McDavid. Some thought his success was due to him. Then, McDavid was drafted 1st overall by the Edmonton Oilers in 2015. DeBrincat did not stop his success. 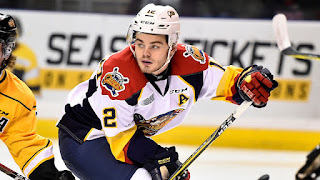 Right now, the Otters have 16 games remaining in their schedule and DeBrincat is within 7 points of his career high. He's on pace to finish the season with 130 points. For what it is worth, Patrick Kane scored 145 points in his season with the London Knights before being drafted by the Blackhawks in 2007. Last week, DeBrincat was the OHL Player of the Week, tallying 11 points in 3 games. It's the third time this year he has earned that honor. In the process, he recorded his 300th career point with the Otters and became their All-Time Leader in career goals. So what does this mean for DeBrincat. When Erie's season ends, the Blackhawks could bring him up. He would not qualify to play with their AHL affiliate, Rockford Icehogs because he won't be 20 years old until December, 2017. He will definitely get his shot at some point, whether it is later this year, or at some point next year. 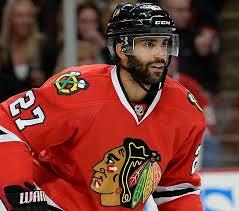 He signed a 3-year contract with the Blackhawks in November, 2016. His size may or may not be a factor. The league has become all about speed and DeBrincat has it. The league already has a few stars that measure rather small on the height scale. Time will once again tell, but the Blackhawks have yet another diamond in the rough waiting for his chance to shine with the big club. The Chicago Blackhawks had a daunting task heading into this week with road games in Minnesota (who they had lost their last 8 games against), Winnipeg (who have beaten them 4 straight times this year), and Edmonton (where they were beaten soundly, 5-0, in November). The results? Three road wins that leave the Blackhawks with a 5-game winning streak and a week off before they play the Oilers, again, on Saturday, 2/18. It's odd to have a full week before your next game, but that is what the Hawks have been dealt. Going into those three games this last week, the Hawks knew they wanted to make a statement with these teams that have man-handled them as of late, and they did so. On Wednesday, the Hawks had to take the Wild to overtime before Jonathan Toews came through with the game-winner. 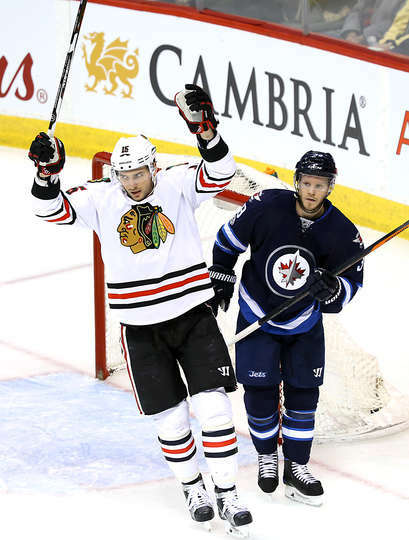 On Friday, the Hawks used a strong third period to take down the Jets, 5-2. Saturday, the Hawks controlled the pace after giving up the first goal of the game by scoring the last five, in a 5-1 win in Edmonton. The Wild still hold a five point lead over the Hawks with two games in hand, but the team is still focused on somehow catching the Wild or to finish as high as they can in the Conference. They currently hold a 12-point lead over the St. Louis Blues for second place in the Central Division. They know that there is definitely room for improvement, but this will be a nice rest for the players, especially those that went to the All-Star game. The Blackhawks have played tight games all season. They lead the league in one-goal decisions (32 games, 20-7-5) in 57 games. With having won their last two games, on the road, by a combined total of 10-3, is encouraging for a team that has struggled, but found ways to win throughout the year. A big reason for the surge lately by the Hawks has been the point production of their Captain, Jonathan Toews. After a very slow start, (22 points in 39 games), he has tallied 13 points in his last 9 games. His next point will be his 600th of his career (262 G, 337 A). Some questioned that he may be ailing from an early season injury, or that missing someone consistent on his left side of his line is the cause for the lack of production, but Toews has had slow ruts in his career before, and like now, is starting to heat up. He has taken 31.1% of the entire teams faceoffs this year and has won 57.1% of them. A stat that goes unnoticed, but plays a big role in puck control and draws won in your own zone that do not result in goals against. 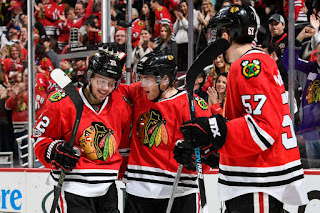 With Toews getting hot, along with Patrick Kane (9 points in last 5 games - 4G 5A), and a rest of a full week, the Hawks are feeling good about what they did this last week and what is to come. Time to heal and refuel for the last leg of the season and the quest to drink again from Lord Stanley's Cup. 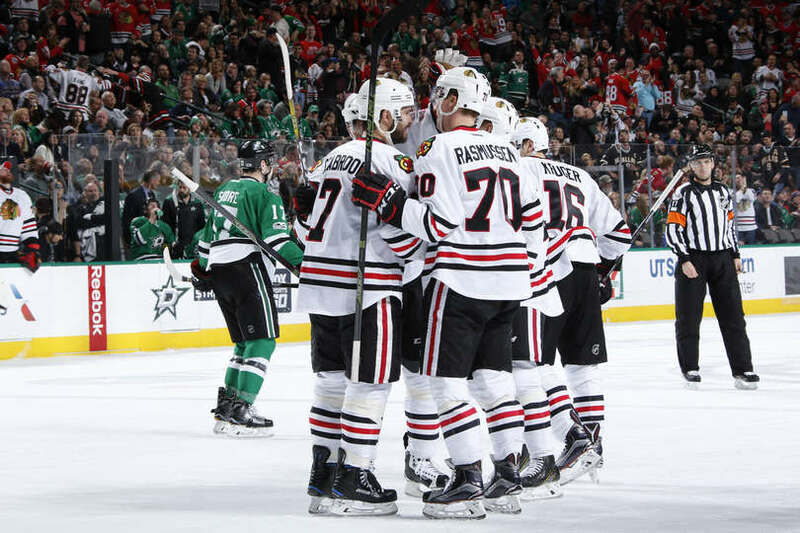 The Chicago Blackhawks gave up yet another third period lead, before battling back to beat the Dallas Stars, 5-3 in Dallas tonight. 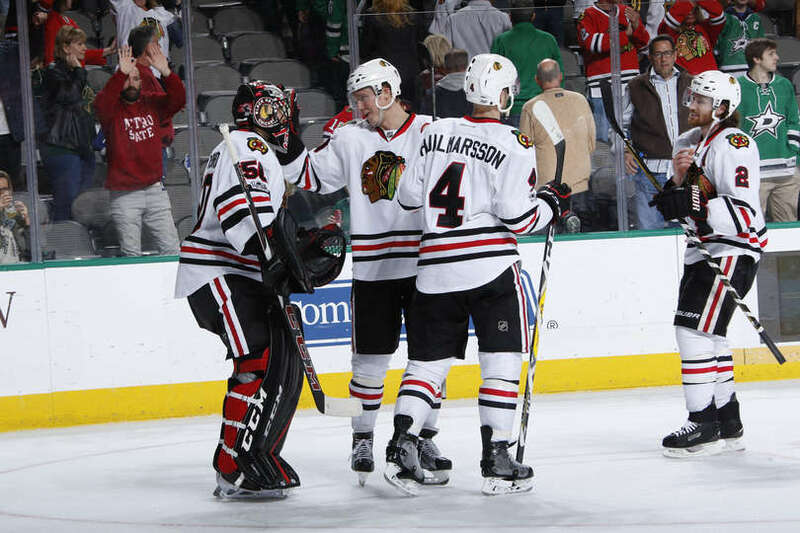 The Blackhawks had yet another rough go, entering the third period in Dallas. After giving up the first goal of the game :08 into the second period, the Hawks battled back to take a 2-1 lead at the end of that period, thanks to goals by Hartman (12th), and Forsling (2nd). Jamie Benn tied the game with another early goal. This time :40 into the period. Tyler Seguin then picked Forsling's pocket and scored to give Dallas a 3-2 lead. Here we go again. Tonight though, would be different. Just :35 after Seguin gave the Stars the lead, Patrick Kane got in and stick-handled his way to the net and around Stars goalie, Kari Lehtonen, to tie the game at 3 (his 17th). It was the first goal the Blackhawks had scored in the 3rd period since January 22nd, against the Vancouver Cancucks (5 games ago). Again, it had been FIVE games since the Hawks had scored a single goal in a 3rd period. Then with 4:03 remaining, Trevor van Riemsdyk followed up on an Artem Anisimov shot and poked a loose puck into the back of the net to give the Hawks a 4-3 lead. Corey Crawford then came up huge, late in the period, and Jonathan Toews ended the scoring (10th) with an empty net goal. It was a night of franchise milestones as well. 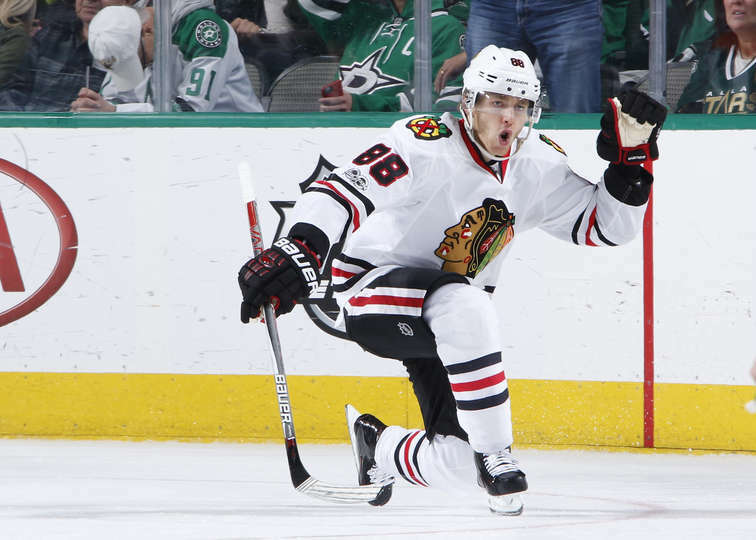 Patrick Kane scored his 268th goal as a Blackhawk, placing him in a tie for 6th All-Time with Tony Amonte. Kane was previously in a tie for 7th All-Time with Jeremy Roenick (267). Also, Corey Crawford climbed to 3rd All-Time, on the Blackhawks goalie win list (202). 'Crow', surpassed, 'The Eagle', Ed Belfour, and did so in 55 fewer games.